One can only marvel at this ace cardiologist’s wide list of career achievements, titles and affiliations, and his contributions, such as helping to start the free medical clinic at Global Mall. Like innumerable hopefuls from India, Dr. Sreeni Gangasani came to the U.S. in 1993 to pursue higher studies in medicine and build a career. Early on, while doing his medical school days at Kurnool Medical College, he had the opportunity to closely observe numerous cases of rheumatic fever and its impact on heart health, an interest that eventually le​d him to specialize in cardiology. Over the years, this brilliant, hardworking doctor has scaled ever greater heights in his career and public life. He became President of Georgia Association of Physicians from India (GAPI) in 2010, then a Member of the Board of Trustees, and Chairman of the Board in 2013. He is on the Board of Trustees for AAPI (American Association of Physicians of Indian Origin) and has been elected as convention chair for the AAPI Atlanta convention 2019. He has headed numerous other organizations and associations—Chief of Department of Medicine, Gwinnett Health System; Chair, IMG section, Medical Association of Georgia; and Director, GMC Foundation. The demands on his time are huge. As a practicing cardiologist with the 13-strong Cardiovascular Group in Gwinnett County, Lawrenceville—they have 10 offices all over Gwinnett, one in Fulton, and one in Walton County, Loganville—he sees patients in four offices and three hospitals. So what sets Dr. Gangasani apart from so many other equally talented professionals in his field? Commitment to his career has never been enough for him. From running free clinics for local residents to setting up rural school projects in his native Telangana, the doctor confesses that public service is what gives him an immense sense of fulfilment. He is an active participant in Indian-American community organizations, having served as Trustee, Hindu Temple of Atlanta and Trustee, North America Shirdi Sai Temple of Atlanta. In an unrushed chat with Khabar, Dr. Gangasani shared memories of the early days of his career and numerous philanthropic initiatives. 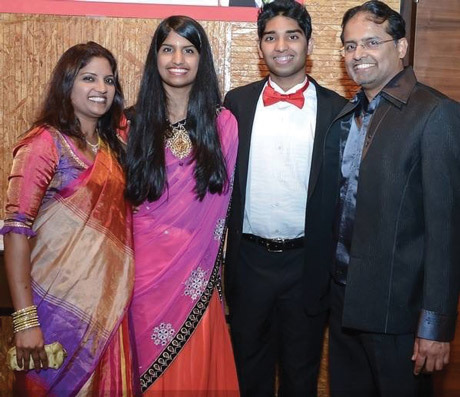 After completing his basic medical degree from Kurnool followed by post-graduation, Gangasani came to the U.S. and completed three years of internal medicine residency and three years cardiology fellowship at William Beaumont Hospital in Michigan. 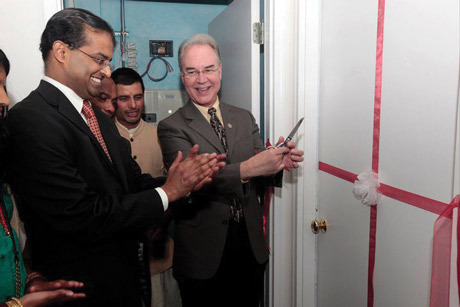 (Right) The opening of the free GAPI Clinic by Congressman Tom Price. Even as his practice has spread wings—the Cardiovascular Group will grow to 15 doctors in August––the indefatigable Gangasani has taken on multiple social outreach initiatives. At first, it wasn’t easy. “When I was the President of GAPI, we wanted to open a free clinic, but [couldn’t] figure out how to make it work. There are many aspects to it, including the medico-legal aspect and the fiscal aspect. But we managed to open the clinic in Global Mall which is still running since 2010, twice a month, on first and third Saturdays of the month. I am the director of the clinic, and along with my co-director Dr. Sujatha Reddy and volunteer physicians Dr. Jay Sampat and Drs. Vijay and Darshana Vyas, we see about 20 patients each time. I have more time to spend with each patient at this clinic. At my clinic we are always busy as I only treat cardiology related problems. At Global Mall I serve as a regular physician / internist, and can assist with people’s health issues irrespective of what the problem is, as these are people who don’t have financial resources and can’t see doctors on a regular basis….There are a group of volunteers that serve and whenever I’m not on call I try to help them.” The Global Mall Clinic is open to everyone. 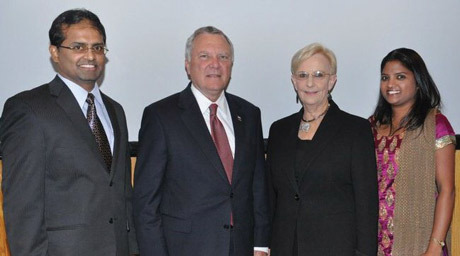 Dr. Sreeni Gangasani and his wife, with Governor Nathan Deal and Mrs. Deal, at a fundraiser. Another area of public service where Gangasani is deeply involved is education for underprivileged children back home in Telangana. And who better than him to appreciate the value of a sound basic education that can power a young person’s dreams? As a boy, he received free high school education from the government-run Gurukul Vidyalaya in Sarvail, Nalgonda district of Telangana. Now, he’s paying back a debt of gratitude to his native state. Speaking at length about his hands-on effort in this area, he says, “Having received my education from a government school as a child, I want to give back to improve their current state. Even in the villages everybody wants to go to private schools. The government schools are neglected in a way, over the years. 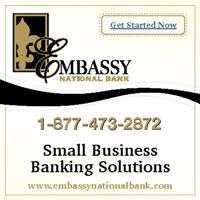 The newer government is trying to put some efforts in financial support but it’s got a long way to go. My #1 goal is to provide government schools with similar resources found in private schools, just so the government school kids will get the opportunity to learn more. My plan is to start one school at a time with an elementary school and high school. Goal #2 was to get these people merit based scholarships, so that we could support these kids further to continue [into] higher ed. Leveraging Rotary Club matches for the projects related to education, sanitation, and drinking water, he is anticipating to contribute $50,000-60,000 to assist 5-6 village schools, helping them to procure furniture and teaching accessories. Gangasani actively facilitates financial aid for students aspiring to higher studies in medicine. He shares a favorite anecdote: “One of the best moments of my career in Atlanta was when a patient (now no more) Mr. Joe Shafer, left me a personal donation in his estate, a donation of $100,000. He was going to the hospital, he had cancer. His last words to me were that he is giving the donation so that I can donate it to my school and college to produce more such doctors. It was a great moment for me.” That money is going to be used for student scholarships for the deserving at elementary, high school, and medical school. The doctor with his wife, Madhavi, and children, Suma and Nikhil. Viren Mayani is a senior contributor at Khabar, specializing in people, music, entertainment, and more. “From the cardiology point of view, I think within the Indian community, the prevalence of heart disease is more than 4-5 times higher than in the mainstream community. People die suddenly, every day, every week. They don’t take care of themselves, they are not proactive, and they go to the doctor only after something happens to them. That has to change. They need to take care of themselves, exercise more, refrain from smoking, take care of high blood pressure, diabetes, etc. I believe they need more education on the matter.